The Co-Prosperity Sphere (C-PS) is an experimental cultural center located in the neighborhood of Bridgeport. The space is used to showcase work by artists, performers and cultural workers of all stripes. The C-PS hosts exhibitions, screenings, presentations, installations, festivals, meetings, and performance programs in its 5,000+ square foot gallery. The space hosts between 35-60 events and exhibitions a year serving over 20,000 individuals. In May 2012 PMI created 12 new temporary initiatives and storefront spaces as part of Version 12 Festival. They were open for one month. Spaces open include: Paratext Books, The SMALL Showroom, Enoch’s Donuts, Quimby’s Bridgeport, Dusty Groove Pop Up Store, Community Supported Supper Club, Private Feast, Setting the Table, The Daley Storefront Gallery, First Lutheran Church of the Trinity Performance Space, BridgePop’s SpringPOP Store, Mike’s Thrift Score, The Salon Series, and the Research House for Asian Art. 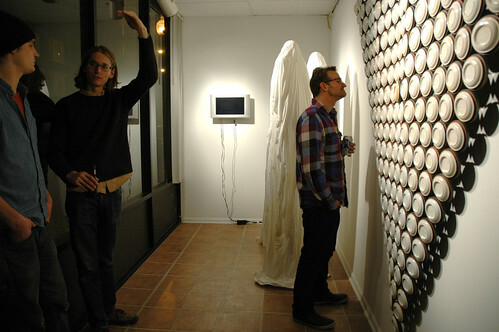 The (Con) Temporary Art Space opened in 2010 as an avenue for discussion, research and action. For three months it became a working studio for cultural workers, producers, artists and designs. The space functioned as a information center, exhibition venue and a place to learn about Chicago’s diverse art ecology. 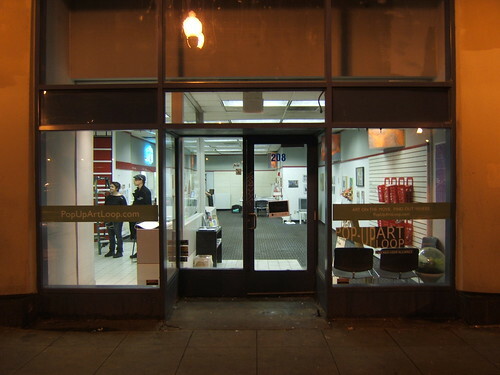 it was located at 208 S Wabash, Chicago Il 60603. Eastern Expansion is a window and installation gallery hosts a solo project by a new artist each month.